Yesterday my mum, sister and I headed off on our road trip to the National Scotland Business Awards Grand Final in Glasgow. After having a wee sing song in the car, swapping my fitness gear for a frock and getting GLAMMED up we were ready to hit the champers and mingle. Only around 80 were there on the night and EVERY one of them had already won their Region (including LDPT). Yup it was down to the best of the best and highly INSPIRING being in a room with so many hardworking, passionate and successful entrepreneurs. With over 20 categories and no idea WHEN my category was going to be announced, not gonna lie…the suspense was brutal. Although speaking to all the lovely people/businesses at are our table definitely helped calm the nerves. And before we knew it BOOM the 1st half of awards were done and we broke for dinner! I NEVER usually drink on a ‘school night’ but by dinner I was a ‘healthy’ amount of voddies in, lol. After tucking into my soup, haggis stuffed chicken and raspberry cheesecake (would be rude not to) Round 2 of the awards begun. 15mins later I was UP along with 4 other businesses!! Yuuup, unfortunately they didn’t say LDPT this time. How do you feel about that then Lee? 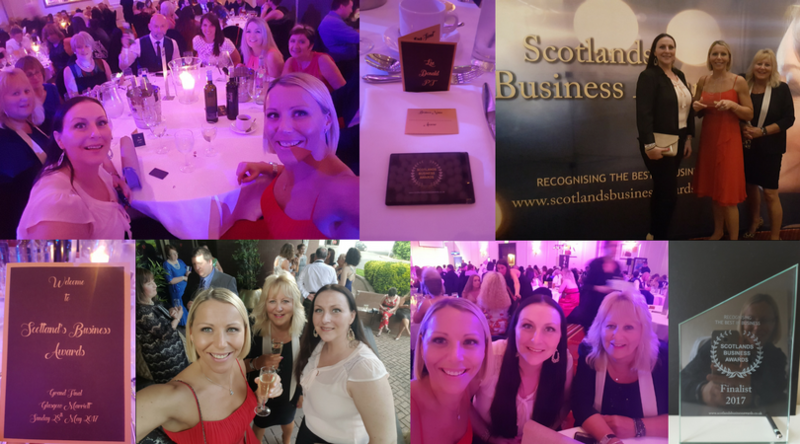 but simply being part of the National Scotland Business Awards was a MASSIVE achievement both professionally and personally for me. No, because the ‘REAL’ goal was winning the Regionals which woohoo got smashed. One of the biggest motivation killers? Thinking of all the things you HAVEN’T achieved instead of focusing on how far you’ve come and all the things you HAVE. Is the motivation, inspiration and drive to be even BETTER than before!! And hey, I got to spend some QT and share an amazing experience with my mum and sister. I met some fantastic people, ate good food and had a great night. And what’s really BLOWN ME AWAY is the most incredible support from all the voting to the kind words from everybody. From people I know to those I’ve never met – I cannot thank you enough! !